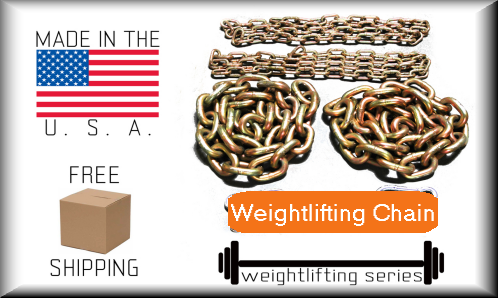 Weightlifting Chain for power lifting is available in various lengths and weights. The advantage of using chain is that you can incrementally increase the resistance through adjusting the leader chain length. This helps not only increase speed but also improves the weak points in a lift. If you go by the general rule of 10-20% weight of your max lift, you should be able to figure out the best weight to purchase. Keep in mind that you can always remove weight, so if you know your goals you can plan ahead. Custom cut weight lifting chain is non-refundable. Our normal return policy applies to our weight lifting package options.